I am sure you have noticed I have a little obsession with Avocado's, as has most of the UK at the moment. Avocado on toast, avocado in salad, avocado mousse, you name it the Avocado is involved. 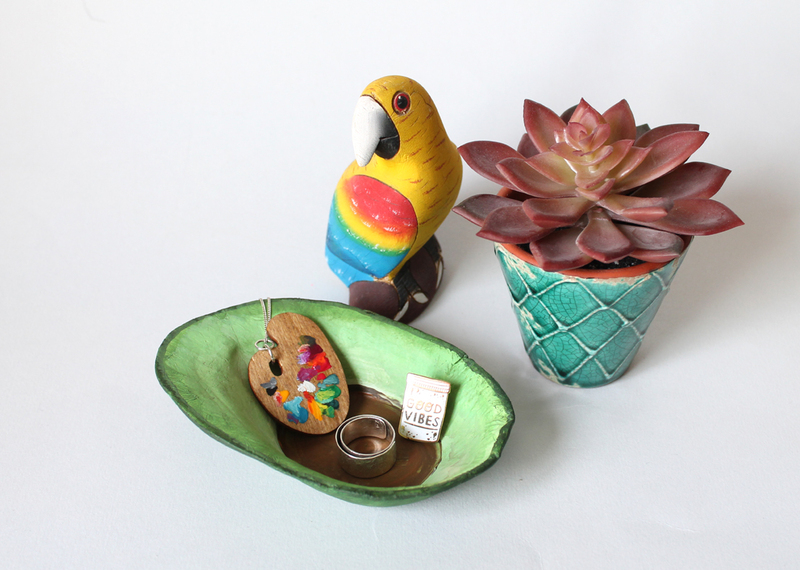 So I thought I would make a DIY with the thing of the moment and make this Jewellery dish for all your little trinkets. Be warned though, if you are like me you will think that it is leftover avocado! I found myself nearly putting it away in the fridge a few times! Long week! 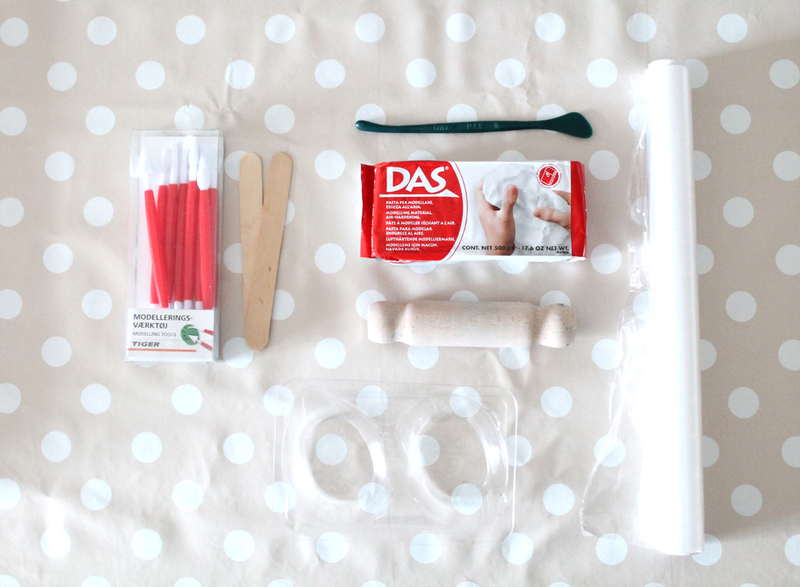 First up, you will need to make the dish itself and leave it to dry for a few days, so for this you will need: Air dry clay (I used Das), cling film, rolling pin, mould (I used the container that my avocado comes in, as it makes the perfect shape) and cutting tools. Step 1: Cut out one of your moulds and then put cling film all over it. 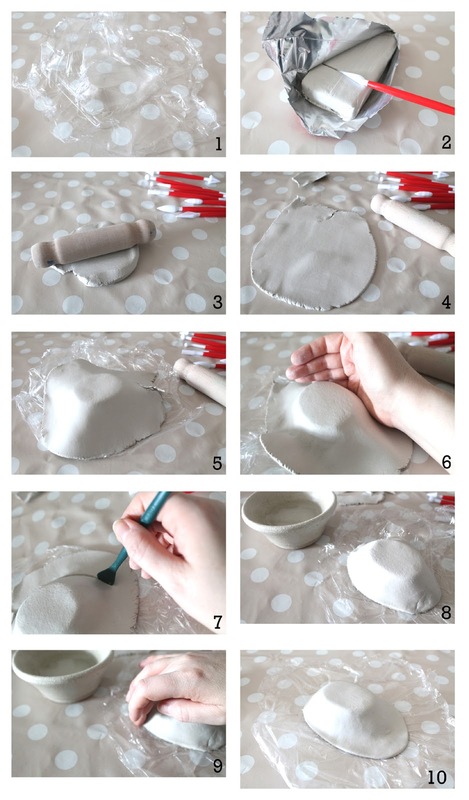 Step 2: Cut off a chunk of clay from the packet. Make sure you wrap the packet back up with cling film and put it in a bag to keep it from going dry for the next time you want to use it. Step 3: Roll out the clay to your desired thickness, I went for about 3/4mm as I wanted it to dry quicker and didn't want it to be too thick on the edges. Step 4: Once it is rolled out, smooth over any cracks with a little water on your fingers. Do not dampen it too much or it will get sticky and unmanageable. Step 5: Place your clay over the mould. Step 6: Using the edge of your palm, smooth down the clay around the mould. Step 7: Cut out the Avocado shape around the mould. Step 8: Make sure your edges are loose from the table at this point if you didn't use cling film, otherwise it will stick. Step 9: Smooth over the edges with wet fingers, so that there will not be sharp edges when you want to use your dish. Step 10: Leave to dry for a good few days. The clay will dry out and may shrink a little. Once you have your dish all dried out you will be able to paint it. 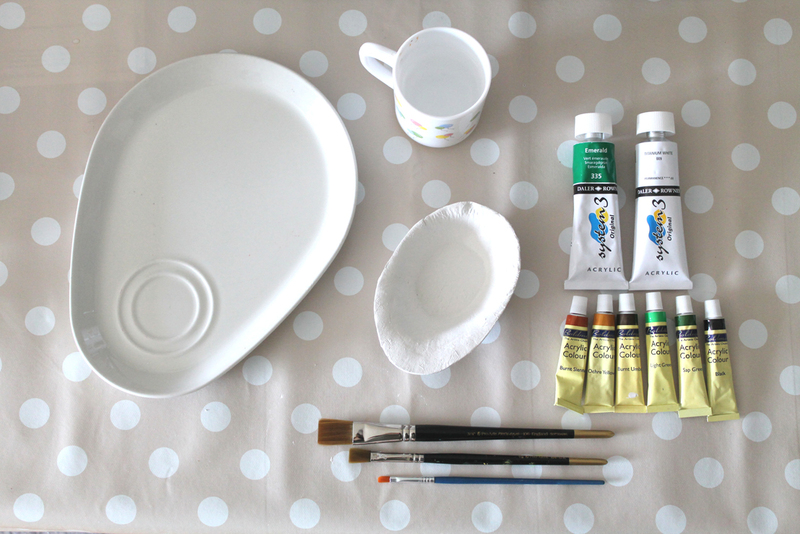 For this you will need: Acrylic paints, brushes, water pot, paint palette and your dish. Step 11: Firstly get some varying colours of the green and brown on your palette, I find it much easier when I have all the colours in front of me, to help mix them. Step 12: I painted the back first, making it a dark green, giving it two coats. 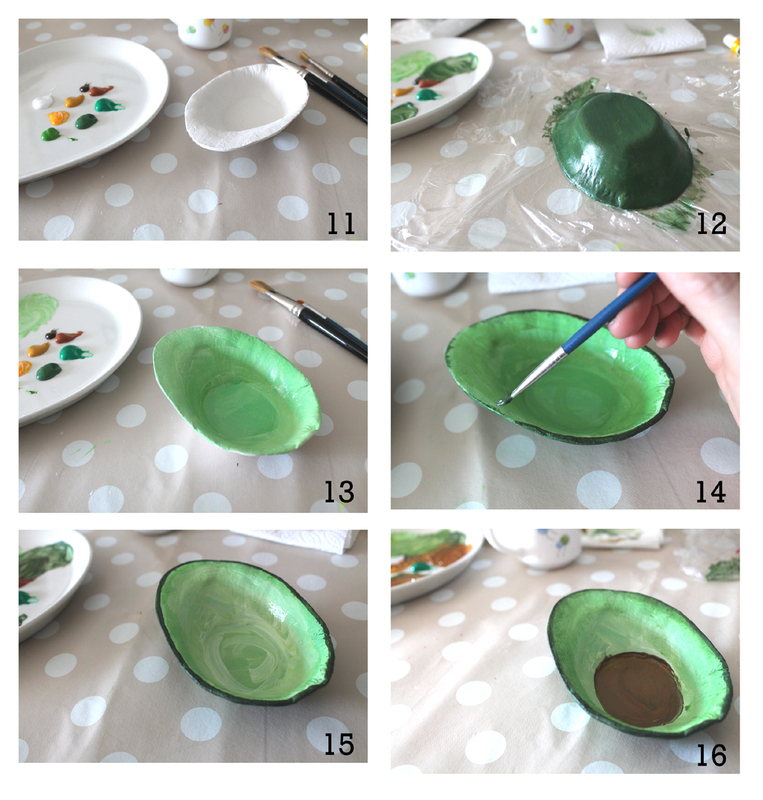 Step 13: Then I painted the inside with a mixture of green, yellow and white, going over the colours a few times to blend all the colours together to give a more authentic look. 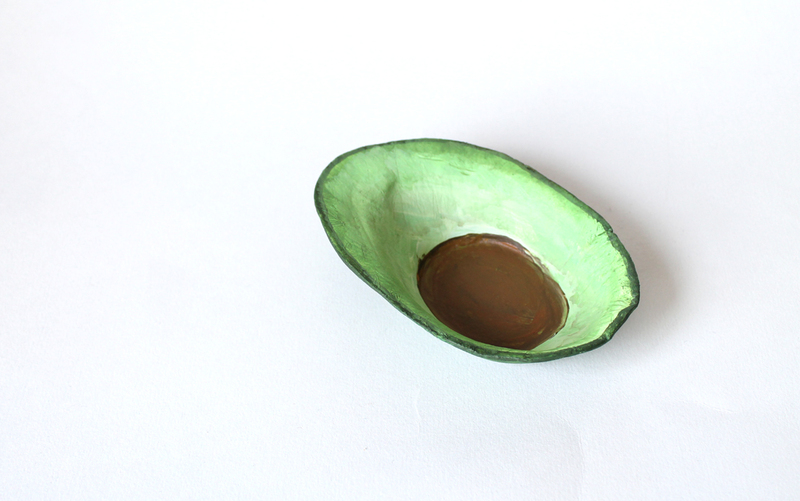 Step 14: Then with the darker colour from the bottom, I painted a line around the edge to act as the husk of the Avocado. Step 15: I went over the colours on the inside again, blending the darker outside line and the area which would have the nut in it. Step 16: Then I was ready to add the brown nut of the avocado, again this was a combination of a few brown colours to make a more authentic look. Then you are finished! 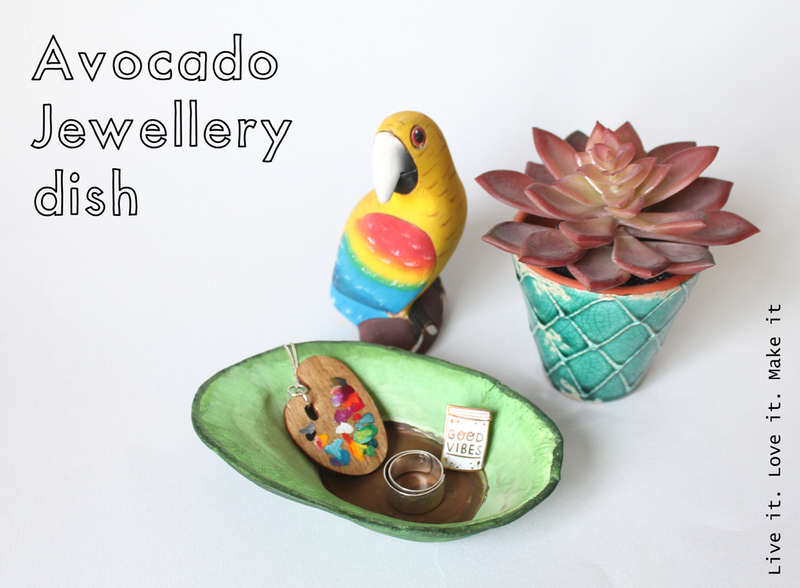 Your own little Avocado bowl to use for jewellery or whatever you like really, it could be a spoon rest in your kitchen too. Hope you like this tutorial, make sure to #livelovemake on social media if you make this project or any of our other projects. Would love to see what you get up to.